Hi all! Did you have a nice weekend? We have had so much snow and snow days that I've almost forgotten what it's like to have my oldest in school. I haven't showed you many images of the living room of the cottage project, so I thought I'd share some progress and give you an example of the power of paint! 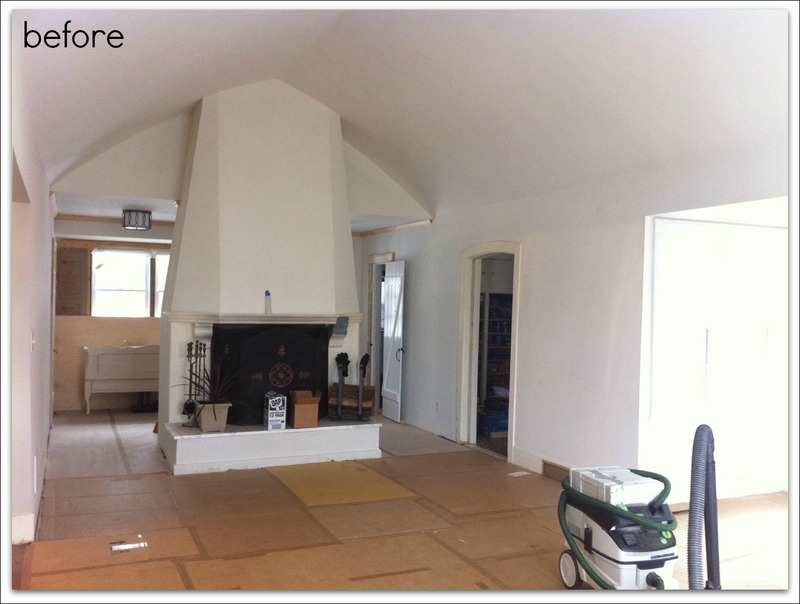 At this point we had removed the texture from the ceiling, the wood floors had been stained, and marble was added to the hearth. Behind the fireplace is the large entry, and the beautiful, original door you see is to the powder room. The trim, walls, and ceiling had yet to be painted. And now...with plenty of paint, her home is looking much better. The walls are Hazy Skies, the fireplace & trim are Chantilly Lace, and the mantel is Duxbury Gray by Benjamin Moore. Obviously I haven't done any styling to the fireplace, but it will come. I'm hoping she agrees to painting the inside of the fireplace black. I'm only giving you small snippets of this home, because when it's finished I'm going to have it photographed professionally. I need to do this house justice! In other client news...I am starting another whole-house project. This sprawling ranch is on an inland lake about an hour away from me. I. Am. So. Excited. I am already in love with this client and am so glad she found me through my Facebook page! We spent three hours together over the weekend and have already made some major decisions. Right now this lake house is what I lovingly refer to as an oak palace...every where you turn there are oak cabinets and oak trim. They've been trying to "embrace the trim" but it's really not working for them. This is what you see as soon as you walk through the door. This is not their primary residence, but they plan on keeping this home forever, so they're ready to make it their own. I'm so blessed to get to do a job I love for such kind people. All of the trim is getting painted White Dove OC-17 BM, and the kitchen is losing walls, losing the bulkhead, and getting a piece of furniture for an island. The whole house is getting maple wood floors. 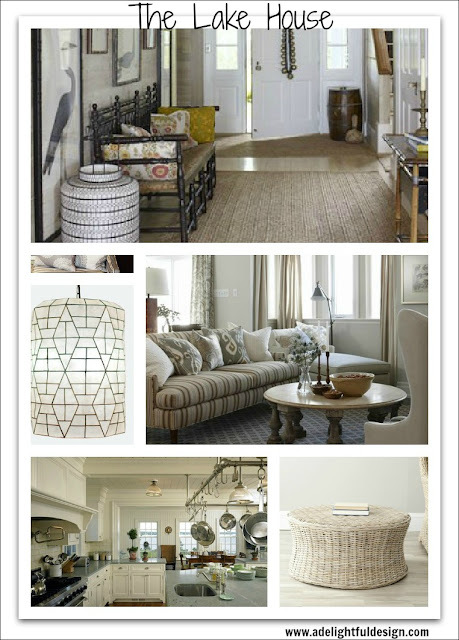 After our first meeting I did a little pinning to gather a few images of my initial vision for the overall home. Don't take anything here too literally, because I know I want more color than this board, but all of the texture and overall feel is what I'm going for. We're going to turn this oak palace into a relaxing retreat for entertaining! Thank so much for reading. I appreciate you all very much! 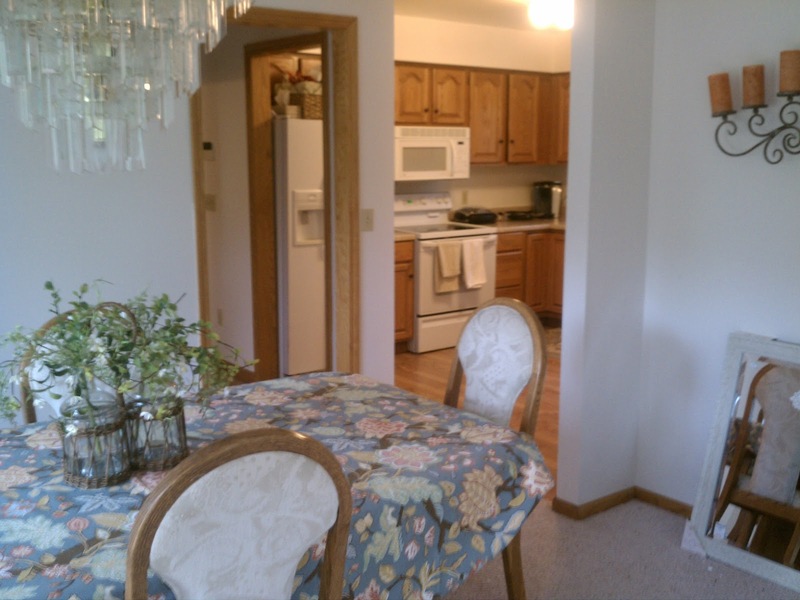 Ooh I can't wait for the professional pics of the cottage! The oak palace reminds me so much of our home before I painted all the trim white. 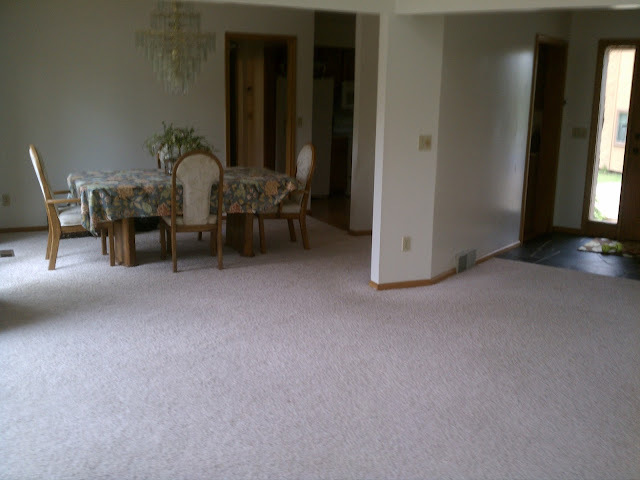 I posted a pic of my family room from last fall on the blog a few days ago and I forgot how ugly that trim really was. I'm sure you will do a great job on the palace as well. Looks like you are one busy gal! Such fun projects and great ideas, you go!!! I love the style you are bringing to this space! It's going to be gorgeous! Both great projects. Can't wait to see the final photos of the cottage - what a fantastic place. Both of these homes have so much character - fun projects to work on Abby. Both have really nice fireplace features too. A fireplace is on my wish list for our next house - I'm hoping. And good for you for getting the cottage project photographed - it's worth the investment to see your work really shine through a professional lens. You are doing such a great job!! Ooh, Abby that high-ceilinged living room in the ranch is so exciting! I can't wait to see what you do with it. Also loving the huge improvement that paint made to the fireplace in the fireplace at the cottage. The cottage looks great for what you have shown, I do agree about the lighting any the ceiling fixture you found id great. I too have Hazy Skies, and I love the colour!. I can't wait ti see what you are going to do with the ranch house.